Camera operator Albert Maysles and his sound engineer brother David documented these unconventional subjects after making Gimme Shelter, their celebrated film about The Rolling Stones. Entering into the women’s cramped and squalid natural habitat which they shared with several cats and racoons, the filmmakers captured rare footage and the odd spontaneous performance too. Little Edie parades around in a variety of outrageous outfits always accessorised with some kind of self-styled head scarf, whether a hand towel or an old sweater. Occasionally there will be a serious gold or diamond brooch pinning the whole thing together, remnants from more affluent times. The two Ediths used to be glamorous high society girls, as evidenced in a series of stunning archival photographs, and their greatly reduced circumstances are shocking to behold. But the pair gained cult status through this documentary and are now being celebrated anew. 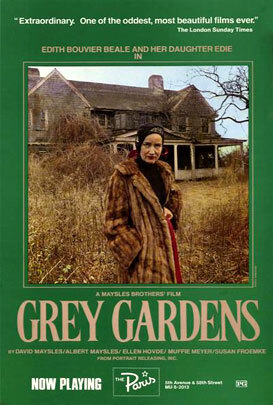 The multi Tony Award-winning musical Grey Gardens closes on Broadway today after bringing the pair even more notoriety. Now deceased, Big and Little Edie were true non-conformists but, as Albert Maysles says; “If you have a low tolerance for people who are different, you might feel embarrassed for these women” as they lay themselves bare for all the world to see.